Chinese New Year falls on 15 February in 2018, ushering in the Year of the Dog and a whole host of delicious dishes to celebrate. Learn how to cook a particularly interesting – and delicious – salad to kick off any banquet, and you’ll be shouting lo hei! before you know it. Kunghei fatchoy! Whether you’re looking to host an elaborate multi-course dinner to celebrate the Year of the Dog or just want to know a little bit more about it, there’s one dish that’s perfect for kicking off the festivities. 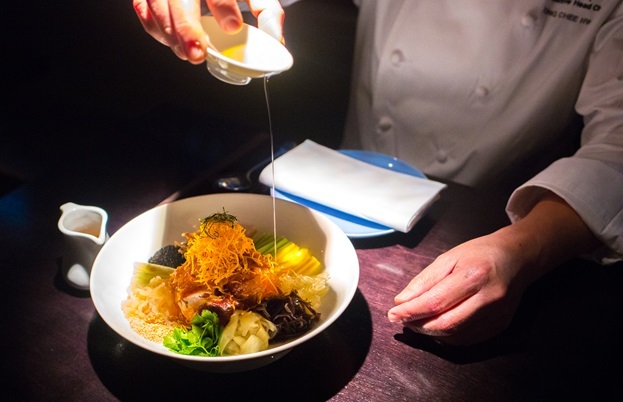 We paid a visit to Hakkasan Hanway Place to talk to master chef Tong Chee Hwee about the famous Singaporean delicacy Prosperity salad (also known as Lo Hei or Yu Sheng), his take on it and how it should be served during Chinese New Year. With all the recent fuss over spiralized vegetable salads, it might surprise you that many traditional Chinese dishes consist of different strands of thinly-sliced vegetables tangled together in a dressing. Prosperity salad is one of these – while some of the ingredients can change depending on who’s cooking it, shredded vegetables are a must. 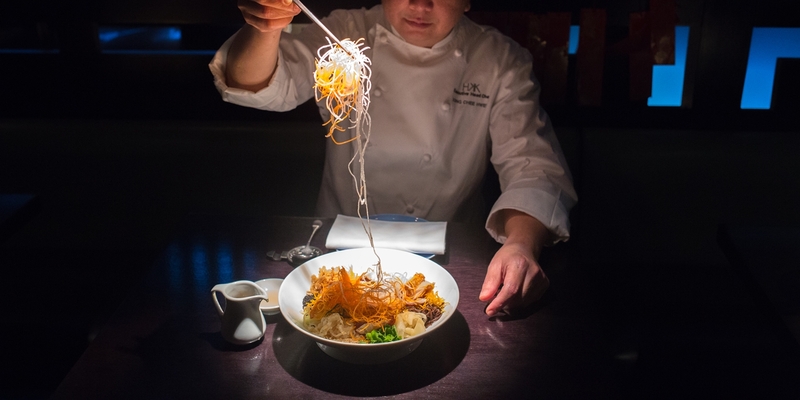 Chef Tong has added his own twist to the dish for the menu at Hakkasan, which replaces the traditional strips of raw fish with something new. There are eighteen ingredients in chef Tong’s salad: roast chicken, enoki mushrooms, green apple, pickled onion, carrot, sweet potato, cucumber, pickled ginger, lime leaves, mango, mooli, black and white sesame seeds and coriander are more familiar ingredients, but there are a few unusual ones too. Dried jellyfish, pomelo and pak-pui mushrooms might require a trip to a specialist grocer, but they’re essential to the balance of the dish. Right before serving, the dish is dressed with oil and plum sauce – and that’s when the fun begins. Eating a Prosperity Salad isn’t as straightforward as you might think; there’s an entire ritual dedicated to the dish. 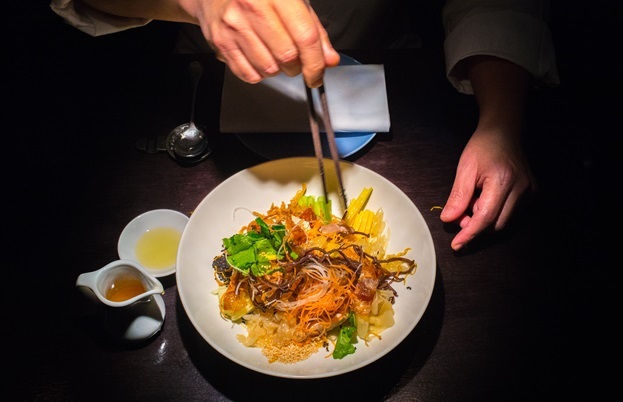 As each ingredient is neatly presented individually on the plate, everyone gathers round the table and gets ready to toss everything together with chopsticks while shouting ‘lo hei!’ (‘scoop it up’). ‘It is believed the higher you toss the ingredients in the salad – which symbolises an abundance of wealth and long life – the greater your fortunes will be,’ says chef Tong. This inevitably can leave the table a bit messy, but that’s all part of the fun; besides, it seems like the most effective way to properly dress and combine every ingredient, so you get a little bit of everything in each mouthful. With its many regions and rich culture, almost all dishes in traditional Chinese cuisine tend to have interesting legends or stories associated with them, and Prosperity salad is no different. Yu can mean both ‘fish’ and ‘abundance’, while sheng means ‘life’, therefore the dish represents an abundant life full of wealth and prosperity. This is why it is often eaten by Chinese businessmen (particularly in Singapore and Malaysia), who were responsible for spreading the salad’s popularity. The salad’s origins, however, can be traced right back to the Song Dynasty around 750 years ago. The seventh day of Chinese New Year is known as Renri (‘everyone’s birthday’), and fishermen would traditionally feast on whatever fish they caught by slicing it thinly (a dish known as kuai. Over the years it gradually evolved into the Prosperity salad served today, with both Singapore and Malaysia laying claim to the recipe. Fancy making Prosperity salad at home this year? Take a look at chef Tong's recipe here.